Cheesecake was my favorite cake growing up. My sister, lover of salty things, would eat the crust, and I would eat the filling. My aunt Pam’s cheesecake is legendary in our family, and to make Amanda happy she added a one inch crust to hers. 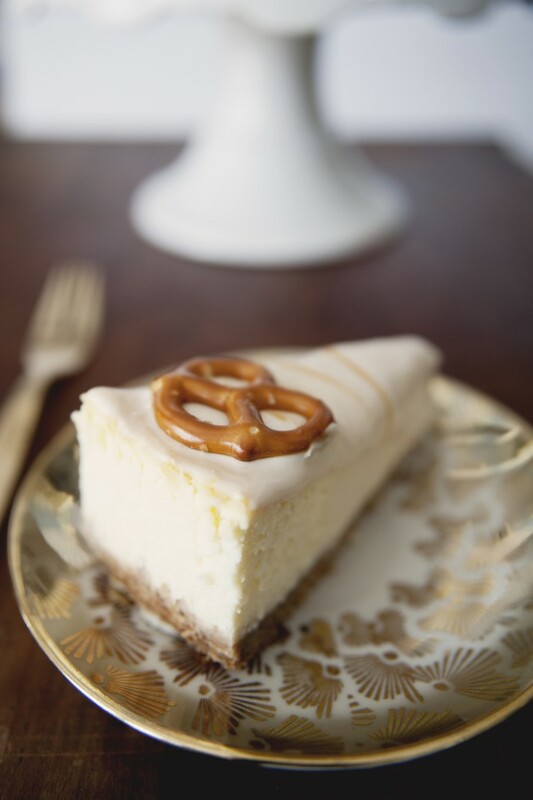 That combination of salty, sweet, and decadently creamy is still a must for me, and in a really over the top moment, I decided adding pretzels to the whole thing was a good idea. Well, in practice it turned out to be an excellent idea. Salty, sweet, and creamy indeed. This recipe is almost silly its so delicious. To make crumbs, just pulse some pretzels in the food processor until fine. Remove, and pulse the graham crackers. Combine crumbs, 1/2 cup sugar, and butter in the food processor until one event texture; press on bottom and sides to 8-inch spring form pan. In a standing mixer with paddle attachment, whip cheese until fluffy; beat in sugar; continue beating until light and fluffy. add eggs, one at a time, beating well after each addition. stir in heavy cream. If at all lumpy, strain through sieve. Pour into the pan. bake at 325F for 1 hour. turn the oven off and leave the cheesecake in the oven 1 hour. Remove from oven and let it cool gradually to room temperature, chill in the fridge for at least 4 hours. 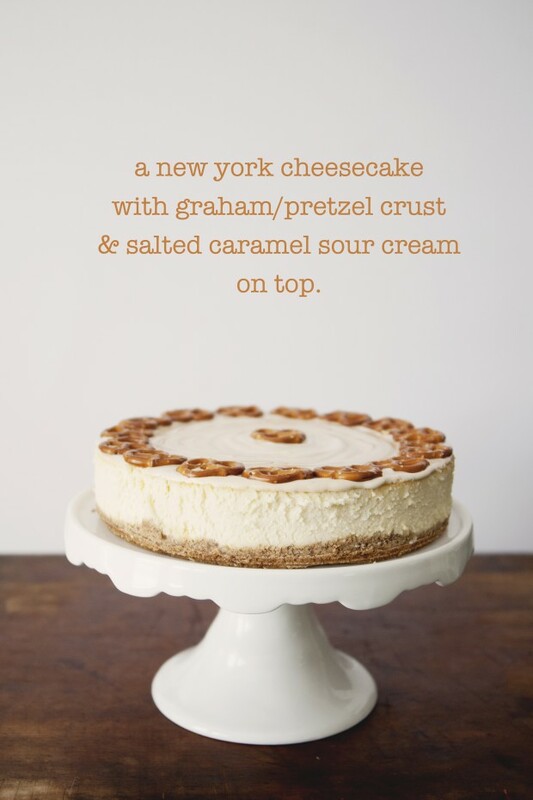 When ready to serve, combine salted caramel sauce and sour cream, and spread on top of cheesecake. 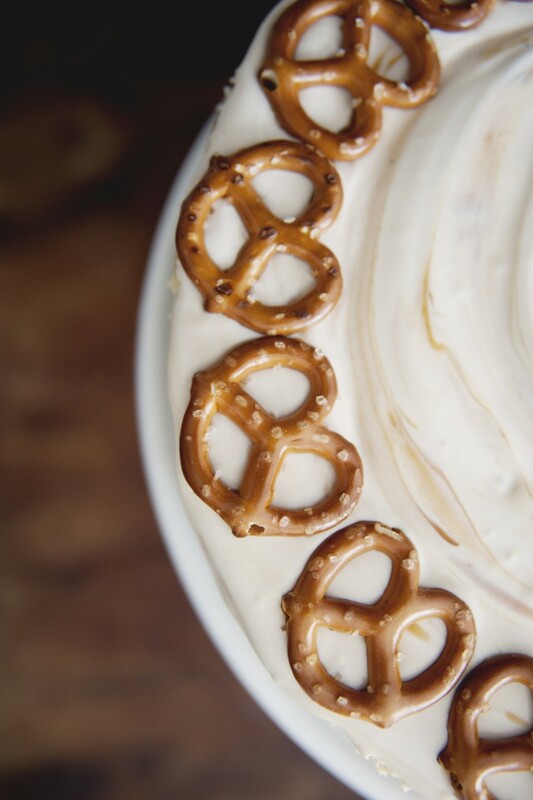 Garnish with pretzels. For the caramel sauce, heat the sugar in a saucepan over medium heat, until the sugar turns golden. Stir until all of the sugar is dissolved and just starting to turn a lovely amber color. Turn heat to low, add the butter, and stir to combine. Careful, it’ll foam up. Then add the heavy cream, vanilla extract, and salt stirring to combine. You’ll cook the sauce for about 5-10 minutes, until it comes together. It’ll take quite a bit of stirring! Pour the caramel into a glass jar, let it come to room temperature, and store in the fridge for up to two weeks. Pour over everything and anything!